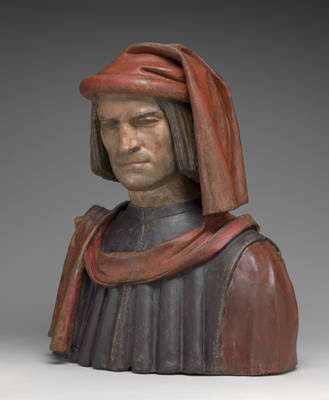 This bust of Lorenzo de' Medici is currently part of the Florentine Sculpture Collection at the National Gallery of Art(NGA) in Washington. It was returned to the collection in 2006 after a period of research and restoration spanning a decade. 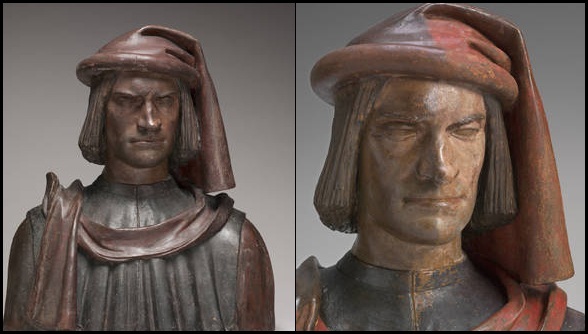 Once believed to be a work of Michelangelo, the attribution eventually shifted to Andrea del Verrocchio and his collaboration with wax specialist Orsino Benintendi. In his Lives of The Artists, Vasari tells us 3 life sized wax figurines were made after the events of The Pazzi Conspiracy. The wax figures were dressed in Lorenzo's clothes, including the blood soaked bandages he wore after the attack. These wax figurines no longer exist, but it is believed this Terracotta bust is based on these original models. 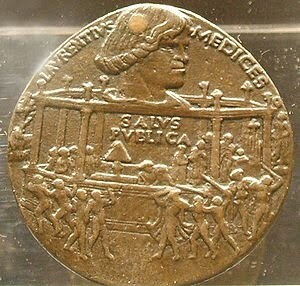 More information on the provenance of this piece is available from this page at the NGA website. The Pazzi attack on Lorenzo and his brother Giuliano in 1476, which resulted in Giuliano's death rocked the City. The ensuing retribution on The Pazzi Conspirators was swift and brutal. 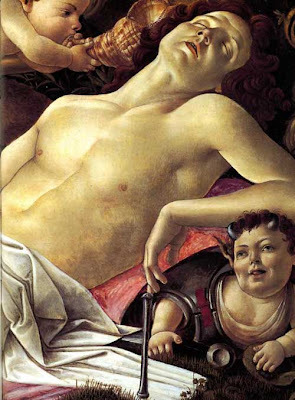 A number of artworks honour Giuliano posthumously, such as portraits by Botticelli , as well as his Venus and Mars, which many believe depict Giuliano as the character portrayed in Angelo Poliziano's La Giostra. This terracotta bust of Giuliano de' Medici is also at the NGA. It is directly attributed to Verrochio. Some speculate the armour depicted was that worn by Giuliano in his famous jousting victory in 1475. Despite being called a 'benevolent tyrant' by contemporaries, Lorenzo de' Medici has become a much beloved figure of The Renaissance. Some admire his vision for a united Italy, whereas others are attracted to him because of his love of the Arts. 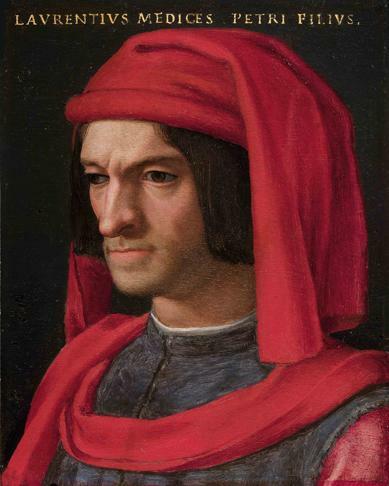 Carrying on the tradition of patronage established by his grandfather Cosimo de' Medici, Lorenzo is perhaps best known to us as the Patron of Leonardo, Verrocchio, Michelangelo, and Botticelli (among many others). Agnolo di Cosimo, commonly known as Bronzino painted this posthumous portrait of Lorenzo. It is quite obviously modelled on the Benintendi/Verrocchio Bust. In a related piece also on display at the NGA, is Bertoldo di Giovanni's c.1478 medallion commemorating Lorenzo and the Pazzi attack. The Benintendi/Verrocchio bust is an intriguing depiction of a personage who has since become an idealised figure, espousing the Humanist passion of the High Renaissance. Coupled with the tragic events of The Pazzi Conspiracy, it is also a macbre reminder of the violent lives led during a time we commonly attribute with great artworks and the rebirth of classical learning. If you're ever in Washington, pay these pieces a visit! Good to know about these because I may make a trip to Washington soon. What struck me about the bust is that it's painted. Of course, the ancients painted all their statues/busts but I thought that the artists of the Renaissance did not. Is this an anomaly? It was not uncommon to paint altarpiece statues made of terracotta, which does not have the shimmering beauty of polished marble. Think of it in the same vein as the figures you see in a nativity scene during Christmas, more designed for reverence then any obliterating aesthetic presence. Thanks for the explanation Hasan. However, I am curious--when you say altarpiece, I immediately think a church altar. But why would this piece (and here I am betraying my lack of knowledge about Renaissance characters) be an altar piece and/or be revered? The Medici are described as the unofficial rulers of Florence during this time (mid-late 15th Century) when Florence still imagined itself a Republic. They achieved this power and influence through their success at commerce, in particular The Medici Bank established by Giovanni di Bicci de' Medici in 1397. This was before the era of the Medici Grand Dukes of the 16th Century. The Pazzi Conspiracy highlights that not everyone was pleased with the power the Medici wielded, so Lorenzo and Giuliano were targeted for assassination. The fact that the conspirators attacked Lorenzo and Giuliano on a Sacred day and in a sacred place, rallied public sympathy to Lorenzo after he survived the attack. The wax models were situated in places of worship to commemorate these events, and remind Citizens and enemies alike of the prominence of the Medici in Florence at this time. Lorenzo was indeed a revered figure even during his own lifetime, earning the moniker 'Il Magnifico' from contemporaries. My previous post about the Empires Medici Special is a fabulous 4 part documentary that will fill you in much better than I can. See episode 2 in particular - as it describes the events of The Pazzi Conspiracy and the rise of Lorenzo. For a quicker run-down, there is also the Pazzi Conspiracy podcast, which is linked to in this post. Great post. That is so odd that Washington has this sculpture. The Pazzi conspiracy plotters really overestimated their support.Say, have you read The The Montefeltro Conspiracy by Marcello Simonetta? It's FANTASTIC. I have indeed Bearded Lady - I recommended it in the original post about the Pazzi Conspiracy, alongside Lauro Martines April Blood! Both are great!! I really like the ferocious head on Giuliano's armor. I wouldn't want to mess with anyone wearing such a fearsome face! (I especially love the detail image of the face that is available on the NGA website. I'll make sure to look at these pieces, the next time I am in Washington DC. The ferocious face had the desired effect :) Between that and riding with the banner of Simonetta Vespucci as Pallas Athena painted by Botticelli, Giuliano could never have lost that joust! The original wax figures were installed as ex-votos in the church of Santa Croce. Such "gifts of thanks" would not have been placed on altars and were never part of altarpieces. In fact, this church (and many others in Italy) became so very crowded with figures, monuments, and other related items that navigation through the church space became difficult. From the 17th century there many campaigns to clear out the churches. 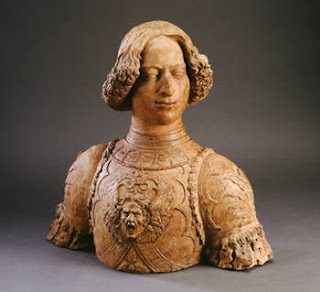 There is really no reason to think that this bust has any connection with Verrocchio or Benintendi. Cheers for the input anon! You mention that there is no reason for the connection - can you clarify - the attibutions listed are made by the NGA Washington (links included above), and are listed as "after" hence are not directly attributed to those artists. I daresay the direct author of those works may be lost to time.